While Chuck was flying his model planes and John was setting up his RV to spend the week camping at Farm Island (he really needs to rent his house out during the summer), I decided to try to get a little paddling in this evening (late afternoon really). 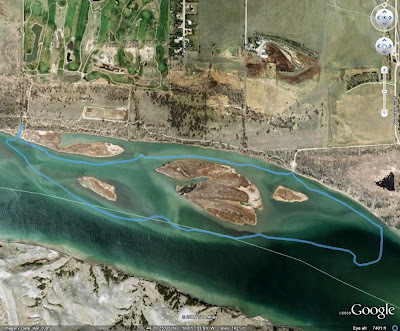 I put in at the boat ramp near the polo fields at Farm Island and paddled around the little islands, up to an unnamed creek, and back to the ramp. It was quite relaxing. I put in an easy 3 miles and was only on the water about an hour. I did get some good pictures of pelicans and a goose too.